This post was supposed to go up yesterday, but I had a few issues with my pictures, so I'm a day late... but better late than never, right?! 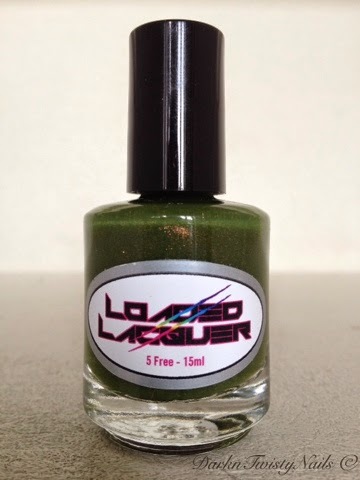 If you've been following my blog for a while, you know I love pretty/ugly colors, especially the murky green ones like Zombie Zest, Walker Bait and It's Alive. 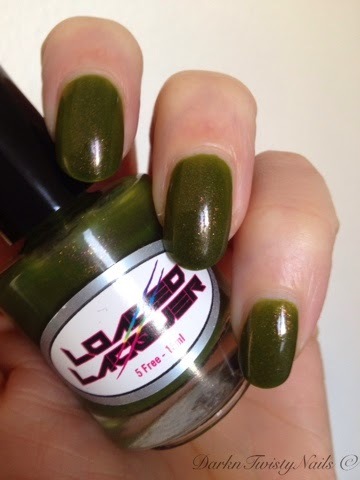 So when I saw a murky green polish in the Zombie Hayride collection, I knew instantly it would be another winner. 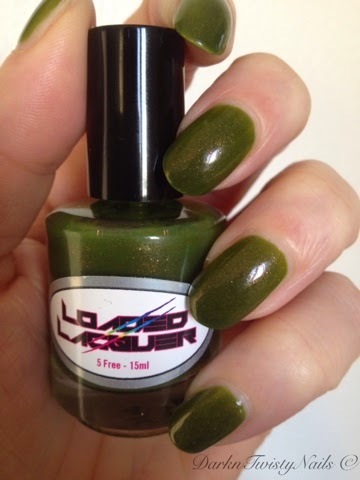 Loaded Lacquer Brain Breath is a murky, slimy green jelly base with a very strong copper, almost pink shimmer. The formula is a touch on the thicker side, but still very easy to apply. Because of the jelly base, you do need 3 coats to get it fully opaque, but it dries so fast, 3 coats isn't a problem at all! Because it's a little thicker, you could get away with 2 thick coats, but I prefer 3 thin coats. I love this color, but I think the majority will say this is a disgusting color to put on your nails. But what did you expect from a polish that's called Brain Breath... it has to be a little disgusting! I can just picture a zombie grunting to another zombie before a hot date: "I just ate lunch, do I have Brain Breath?" The shimmer in this polish is what makes this a winner for me. It gives it just a little extra and it makes it pop on my nails. I've had so many comments on my nails today, positive and not so positive ones, but this baby gets noticed! If you like your polish a little different than most, I'd definitely recommend checking this one out! What do you think about this polish? Gorgeous or disgusting color? Die shimmer!! <3 Mooi lakje, ik hou van groen!